Motorola brought fitness buffs something sweet to their wrist late last year with the watch-like MOTOACTV gadget, but interestingly enough, it’s seeing a new software update right now that brings in a slew of new features. Of course, owners are going to rejoice over it all, especially when the last update merely provided better battery life and a few tweaks. This time around, though, it’s getting over 40 new fitness activities that consist of trackable activities ranging from basketball to yoga, and much more. Beyond that, it offers some enhancements like a wrist-motion detection that automatically turns on the MOTOACTV, as well Wi-Fi connection setup directly on the device to enhance the fitness experience. Therefore, if you were waiting to spice up your usual workout routine, you’ll surely find this update extremely beneficial to keep things fresh, and more importantly, keep you motivated to stay active. So how do you download this new software update? Well, it’s simple as pie! Essentially, all you need to do is connect it to your computer via USB connection, then click on DEVICE, then CHECK FOR DEVICE UPGRADE. I've had this watch since Christmas and loving every minute of it. Motorola is constantly updating the software and bring new features and improvements each time. 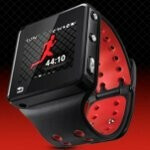 The MotoACTV is truely the ultimate fitness/music/gps watch!